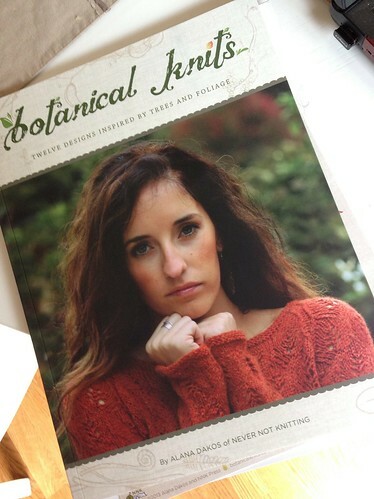 I got a nice, long weekend surprise in the mail today: my copy of Botanical Knits. Sure, I already have the ebook, but there's just something about having the print version at hand. Especially since I plan to cast on one of the sweaters this weekend. At some point in the recent past, presumably when I was drugged up and recovering from my c-section, I agreed to have my brother- and sister-in-law come and stay with us for a week. They'll be arriving this weekend. The good news is, CP is taking a stay-cation while they're here, so it may actually result in more knitting time for me. 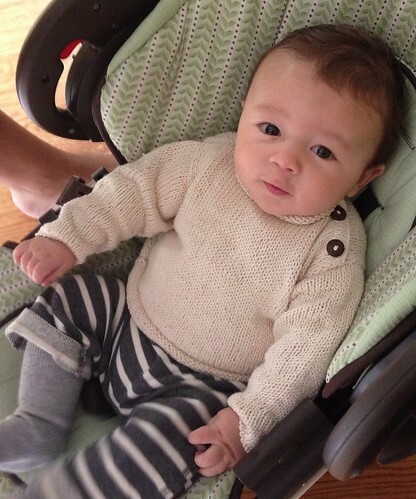 I've learned my lesson about knitting for the present--I'm working on the 12 month size. I'm using some yarn left over from my Rocky Coast cardigan, so when cool weather comes again (I say "again," but to be honest, today's high was 58. Degrees. In late May ...???? ), we can be a bit matchy. 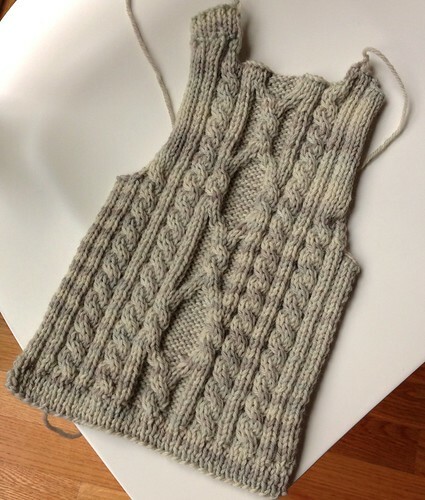 This is the back of the vest, and I realized far too late that no one looks at the back of a vest, and there was really no reason not to just knit it plain, which probably would've shaved quite a bit of knitting time off this project. It's working up quickly enough in worsted weight, and I've already started the front. I'm sure JJ can hardly wait to wear it.